Keanu Reeves' Duke Caboom is the focus of a new Toy Story 4 notebook. It was originally believed he was going to be playing a John Wick-like character, but that is clearly not the case when looking at the design. Instead, Duke Caboom is marketed as "The Greatest Daredevil in all of Canada." He looks more like a Canadian version of Evel Knievel than a deadly assassin, which may come off as a disappointment for some fans. 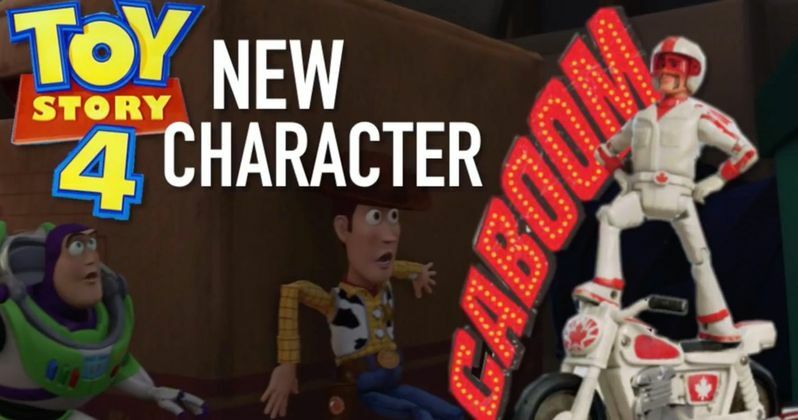 In addition to giving us our best look at the character, the merchandise leak confirms that Duke Caboom was first introduced as an Easter Egg in Incredibles 2. It is believed that Duke Caboom and Bo Peep will meet up in Toy Story 4 when they end up at a store for discontinued toys. Caboom will reportedly end up helping Bo retrieve her sheep. Keanu Reeves recently revealed that he was excited to join the franchise, but did not offer up any details about how Duke Caboom factors into the movie. Regardless, we now know that he is very Canadian and could possibly be one of the biggest heroes that Woody and the gang have ever met, which could bring up a new rivalry. Last month, an eagle-eyed fan spotted what he believed to be Duke Caboom in last year's Incredibles 2. The scene in question shows baby Jack Jack in his crib with an unidentified action figure. That figure has now been confirmed as being Duke Caboom. It's pretty crazy that they were able to put such a subtle Easter Egg in the movie so far ahead of time. Toy Story 4 is all set to hit theaters this summer, after years of waiting. While Duke Caboom wasn't shown with his motorcycle in Incredibles 2, he is shown with the vehicle on the Toy Story 4 notebook cover. The motorcycle matches Caboom's white uniform with Canadian maple leaf logos on it. We might see Keanu Reeves break out more of an exaggerated Canadian accent than we ever have, but we won't know until the movie comes out. Reeves was born in Beirut, but he primarily grew up in the Yorkville neighborhood of Toronto, Canada. Tim Allen was the first to reveal that Keanu Reeves is in the upcoming Toy Story 4. Both Allen and Tom Hanks have talked about how emotional they were when they were recording their final lines. Though it has not been confirmed, their comments lead one to believe that this might be the end of the road for Buzz and Woody and the Toy Story franchise. It was believed that the third movie was meant to be the final installment, but that plan obviously changed. While we wait for the movie to open in theaters, you can check out the best look at Keanu Reeves' Duke Caboom below, thanks to Reddit.